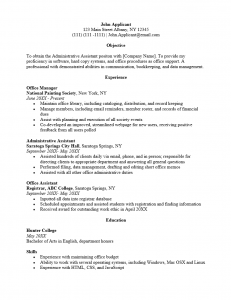 The Office Administrative Assistant Resume Template can be a valuable tool for those seeking an office job as an administrative assistant. This template is geared towards general office administrative support rather than focusing in one industry. As such, a candidate is likely to apply to an impressive amount of opportunities in a short amount of time. This would be the result of utilizing a template that already has a fair amount of its content (i.e. in the “Experience” section) as permanent information and only one or two sections (i.e. “Objective” section) revisable when customizing the resume for a job inquiry. This will improve the turnaround time when a job hunter spots an opportunity they wish to pursue. 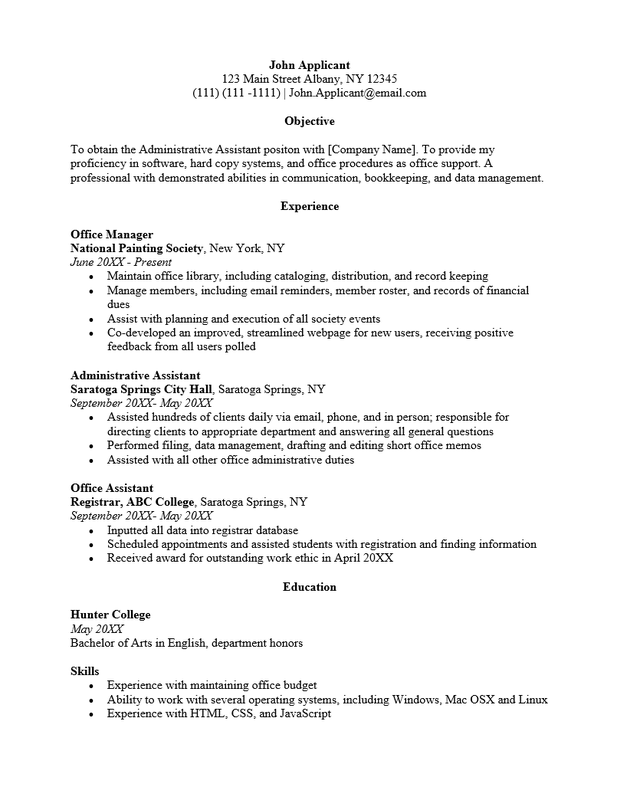 Naturally to improve one’s chances of gaining an interview, a job hunter must be in a clear goal oriented frame of mind with a reasonable amount of time set aside when initially filling out the content for the Office Administrative Assistant Resume Template. The information reported should be verifiable as well. A well-worded professional looking resume greatly increases the chances for an interview so while the set format may be easy to read and attractive, it is the content an applicant places within that will make a resume memorable or remarkable enough to produce an interview. Step 2. Compose one or two statements to make the “Objective.” These should be a brief profile of your intentions and how your strengths relate to the position you are applying to. Step 3. Devise a list of your former employers. This list should be composed of the title you held, the name of the company you worked for and its location, and the dates you were employed. Beneath this document your duties and accomplishments. Step 4. Report your academic credentials in the “Education” section. Step 5. If you have any additional skills whether they are office skills, software proficiencies, or personal abilities (i.e. you are bilingual), list these in the “Skills” section.